The following year the same scholar visited Arunachala during Kritikkai and recited the one thousand slokas, entitled Sivasahasri, extolling the Deity. The listeners were very pleased with the scholarship and beautiful style of the composition. Everyone wondered who that person of simple appearance but with profound scholarship was. They came to know that he was from Andhra and belonged to Kaluvarayi agraharam near Bobbili. His name was Kavya Kantha Ganapati Sastry. They expressed their appreciation of the gifted and blessed being of rare talents. Vinayaka's image. He suddenly felt that a small boy was advancing towards him fromVinayaka. That was also the time when his baby son was born back home. The father named the child Ganapati. Till he reached the age of five all kinds of ailments including dumbness troubled Ganapati. In his sixth year he was branded with a hot iron rod upon which all ailments left him. He was also able to speak thereafter. He then began his studies. Thereafter his life was miraculous with unexcelled intellectual skills of great comprehension, phenomenal memory and amazing intuition. There was nothing he could not understand, nothing he could not commit to memory after hearing once, no sastra that was not grist to his intellectual mill. By the time he was ten, he had memorized several kavyas. In Astrology he was capable of drawing up a panchangam. He also had the capacity to compose Sanskrit verses extempore. As he studied epics like the Ramayana and Mahabharata two great ambitions arose in him. One was to become a great poet like Vyasa and Valmiki - and why not, he thought, was he not already capable of composing poetry? The other ambition was this: in the puranas rishis like Viswamitra, and devotees like Dhruva had by the power of their japa become capable of creating a fresh world or obtaining an abiding place in the firmament. Why not he also become one like them? With such great ambitions the lad continued his studies. imitating the poet, Kalidasa. Within a couple of years he was proficient in Chandas, Vyakarana, Kavyas, and Puranas [?]. He was an extempore poet, an ashtavadhani and an orator. In 1900, while he was at Kasi his friends encouraged him to visit Nawadweepa to participate in the scholars' meet held there. At that meet of great and reputed scholars, he demonstrated his unmatched literary gifts and talents. Thus he earned the title "Kavya Kantha," At that time, he was barely twenty two. For the fulfilment of his second ambition, Ganapati got initiated in several mantras. Among these, his favourite was the Siva panchakshari. In order to perform japa in the prescibed manner, he studied a number of agama sastras. He mastered all the spiritual literature in Sanskrit. He got married at the age of eighteen but with the permission of his father and wife he left on a pilgrimage to the banks of Ganga, Narmada and Godavari to perform japa. He visited almost all the holy places of India twelve times, for performing japa. Though there were occasional spiritual experiences he did not obtain the darshan of Siva, which he desired ardently. At Varanasi, the pleased goddess gave him honey in a dream. At Nasik the temple priest mistook him for a thief and the people of the place beat him up. In anger, he cursed that the people of Nasik should also be hurt like himself physically. Within one month, an unprecedented cyclone struck the town and hurt the people. He had divine powers but they were of no avail to himself! As Ganapati Sastry was studying Vedic literature there arose before his mental eye the glorious Aryan civilisation where people lived in harmony and discipline and were generally happy and peaceful. He compared it with the conditions obtaining in the country in his own time where people were rigid and lifeless. The people made themselves inflexible and bound themselves to various customs and above all, occupied the first place among the enslaved nations of the world! He then resolved that he should reform society and restore ancient values. For this, he decided to bring together and lead young men dedicated to eradicating all the divisive forces in society and to performing mantra japa as the rishis of ancient times did so that a new Aryan society could be built. In this endeavour, Ganapati thought, mantra japa was the key. Ganapati chanted the Sivapanchakshari a billion times; so also he wrote down the name of the Deity a billion times all of which had gone waste. In 1904 Ganapati was appointed as a Telugu pandit at Vellore. He began taking practical steps to realise his ideal and gathered a band of disciples round him. He spent his time in teaching than in imparting mantra japa to the students. 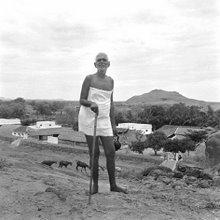 He felt even that was not fruitful and decided to resume mantra japa at Arunachala and reached that place in 1907. Even that was useless in that in spite of all his learning he could not grasp the implication of mantra japa. He was sorry that years of japa did not secure for him the darshan of his ishta devata. During the Krittikai festival of November 1907 while Ganapati was seated in meditation he heard a voice saying that the Deity was asking for him. He opened his eyes but could not see anyone in the vicinity. It was as if it was a disembodied voice. He began walking towards the Arunachaleswara temple, performing his mantra japa within. As he came near, the temple car which had not moved till then began moving. Ganapati prostrated there but even then the Diety did not grant a darshan. Ganapati's grief only increased. The following afternoon he sat in a disciple's house quietly and the name Brahmanaswami occurred to him suddenly. Then he thought that the Swami who had direct experience of the Self would know the secret behind japa and that he would be able to solve his problem. He resolved to seek the Brahmanaswami's refuge. He was not sure whether the Swami would still remember his interpretation of the sloka Suklambaradharam but thought he would still seek the Swami's guidance. The Swami was his only saviour, he concluded. Ganapati Sastry immediately set out for the hill in the hot midday sun. to know what it is. Please enlighten me on the nature of tapas. The Swami fixed his gaze on Ganapati for fifteen minutes. Ganapati was awaiting the reply anxiously. No one else intruded and disturbed them. The Swami spoke in Tamil- "If you enquire and observe where this I-thought arises from, the mind gets absorbed in it. That is tapas [?]. While performing mantra japa if you enquire and observe where the sound of the mantra arises from, the mind gets absorbed in it. That is tapas." The tormented heart of Ganapati had instant solace and got pacified. He recognised that after the Vedic times this was the only upadesa of its kind. A new path for attaining moksha [?] was indicated here. Nobody else had discovered this path earlier. The Swami, the yogi par excellence, had spelt out his supreme upadesa to the mortal Ganapati at the sacred spot of Arunachala in appreciation of Ganapati's prolonged japa. Subsequently, this upanishad was taught to disciples and seekers all over the world. Those who saw the path to moksha [?] were rishis. Ramana who showed this unique path was also a Maharshi. Ganapati Sastry stayed for some hours there and after ascertaining the name of the Brahmama Swami he composed extempore five slokas in praise of "Ramana". At that time Sastry was not aware that Lakshmana Ayyar had referred to the boy Venkataraman as Ramana. Ganapati was instrumental in reviving the name which had fallen into disuse. The next day, Ganapati gave the upadesa to his disciples and told them that it was given by Ramana. He also enjoined on them to refer to the Swami as Bhagavan Sri Ramana Maharshi. This name became world famous. By definition, a person with the following attributes is traditionally referred to as a rishi [?]  one who is celibate, one who performs severe penance, one with complete control over passions, one who is absolutely truthful and one who has mastered the Vedas and Vedangas. The syllables "bhaga" in the word Bhagavan meant prosperity, perfection, dharma, fame, sreyas, jnana [? ], vairagya [?] and the like. Both the words `rishi' and `bhagavan' were appropriate in the case of Ramana. Ganapati felt that he got the upadesa due to the grace of Goddess Uma. As a token of gratitude, he composed Umasahasram (one thousand slokas in praise of Uma) and dedicated the book to her-all in three weeks. Inspired by the divine presence of the Maharshi he dictated the last three hundred slokas to four amanuenses. The Maharshi who was watching silently till then asked, "Has everything been noted?" Kavyakantha submitted that it was all noted. Those slokas are held to be Maharshi's but merely voiced by Ganapati. Though he revised several slokas of the work subsequently, Ganapati found nothing to revise in the last three hundred slokas. as taught by Bhagavan. One dawn, a brilliant light arose and touched the forehead of the Maharshi six times, Ganapati noticed this and also observed that the light got absorbed in the aura around the Maharshi's head as six star- like formations. With the Maharshi's permission Ganapati left Arunachala in 1908 for Tiruvottiyur near Madras for performing tapas. He performed tapas [?] in a Ganesa temple for eighteen days. On the last day he had a problem during the tapas [?] and felt that it would be fine if the Maharishi were to give his darshan. He was asleep while being, wide awake. All of a sudden Ramana arrived there and sat by Ganapati's side. Surprised at this, Ganapati tried to get up but the Maharshi pressed him on the head and made him sit. Ganapati felt as if an electric current had passed through him. He took it to be initiation by hand (hasta- diksha). About twenty one years later, on 17 Oct 1929 to be precise, Ganapati narrated his experience to the Maharshi. The Maharshi also confirmed it, saying, "Several years ago I was resting at Virupaksha cave. I was not in samadhi. Yet I felt as if the body was floating in air. As the upward floating continued all material objects vanished from my sight, only white light was all around. Suddenly the body began descending and objects came into view. I thought this was what was meant by the disappearance and reappearance of those with occult powers (siddhas). It struck me that it was Tiruvottiyur and I walked along a main road. As I did so I noticed a Ganesa temple at a distance and I went in. I do not remember what I did or what I spoke. At that stage I woke up and found myself to be asleep at the Virupaksha cave. I narrated this experience at once to Palaniswami." Ganapati himself confessed that however much he tried to follow the jnana marga [?] he had not been able to achieve abidance in the Self. In the first years possibly the latent tendencies proved to be insurmountable obstacles. Also, the activities of the sakti in the body were intense which it could not bear. On such occasions he would seek Bhagavan's help and get over that. Bhagavan had great love for Ganapati Sastry. His erudition, exalted ideals, and the power of his tapas [?] endeared him to Bhagavan. But for Ganapati's encouragement Bhagavan would not have composed poetry in Sanskrit and Telugu. In order to realise his ambitions Ganapati participated in politics and social reform activities till 1930. Thereafter he gave them up and devoted himself to tapas [?]. 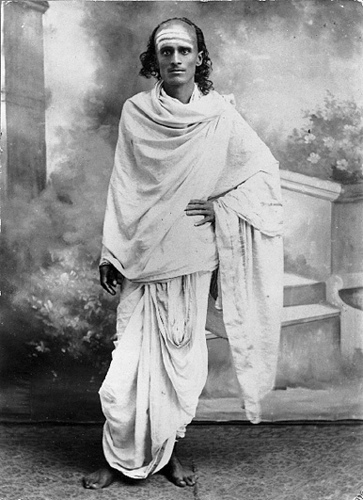 He left his mortal body on 25 July 1936 at Nimpura near Kharagpur in his ashram.